One of the more remote stretches of highway in Minnesota, Highway 11 straddles the Canadian border between International Falls and Baudette, MN. 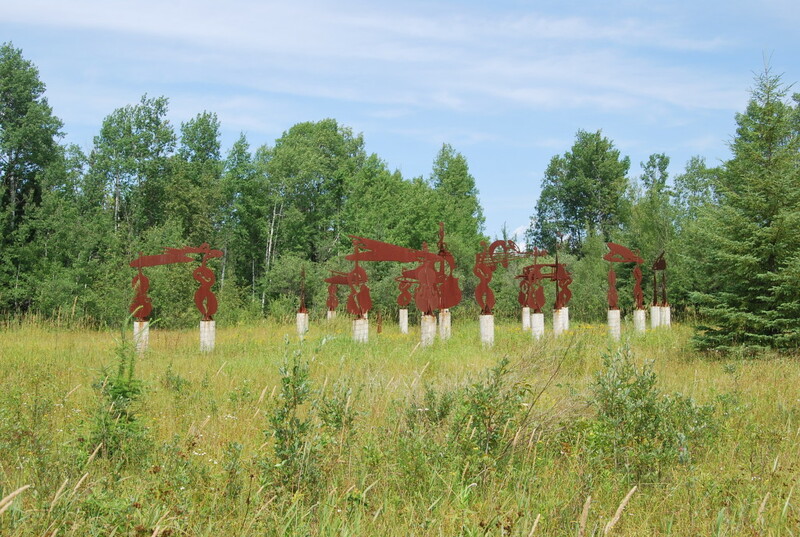 This is an area of no cell phone service, beautiful scenery along the Rainy River, and a roadside attraction that is just as bizarre as it is isolated. It’s called Basshenge, and the concept is similar to England’s Stonehenge. 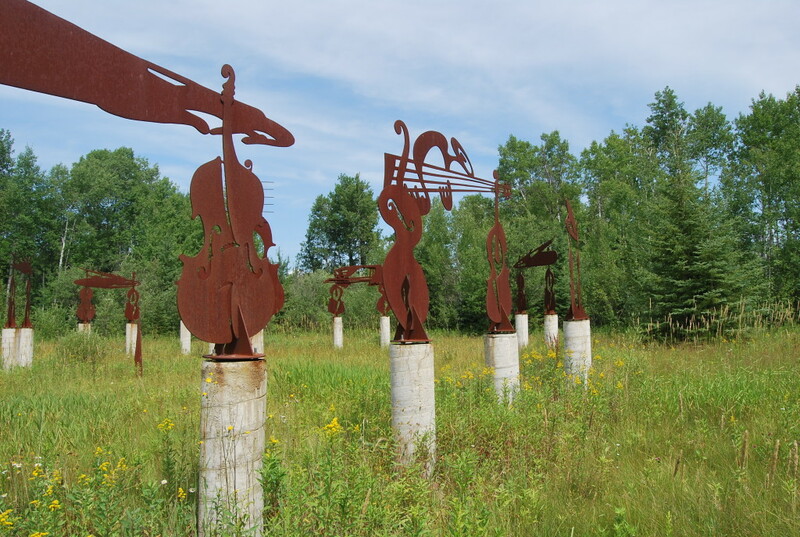 Except on top of the stone columns, there are fabricated bass instruments, made from 3/8″ inch steel plating. 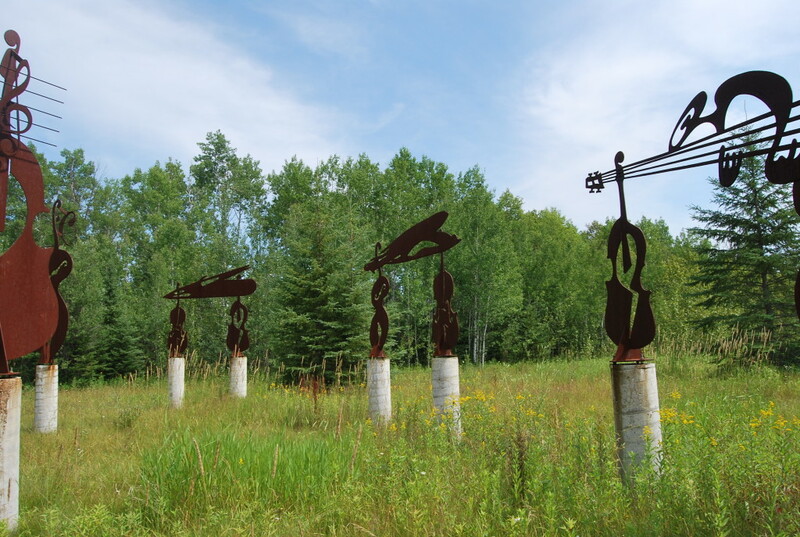 There are 21 basses total, 18 of them measure six feet tall, and three in the center are around 10 feet high. 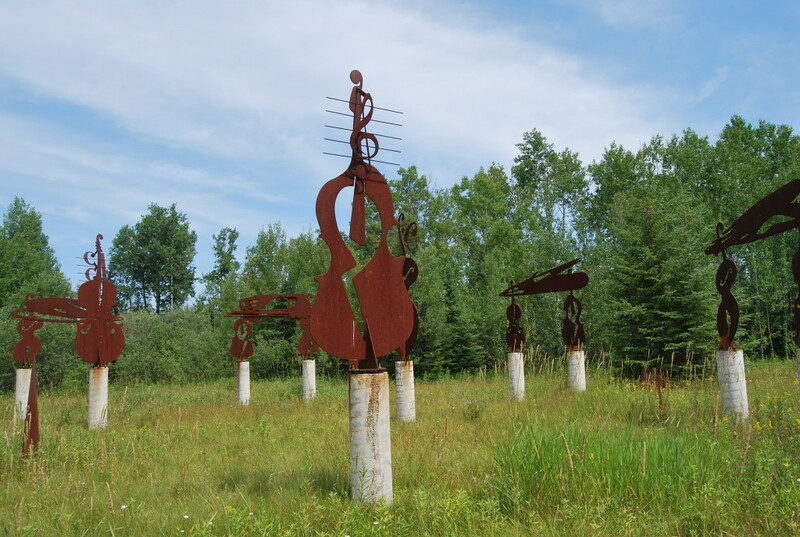 The pairs of basses around the outside circle are connected by metal crosspieces called “lintels,” each of which represents a different virtue like patience, love, or the brotherhood of musicians. Basshenge was the brainchild of Chicago Symphony principal bassist Joe Guastafeste, who arranged for the construction of the project in 2001. 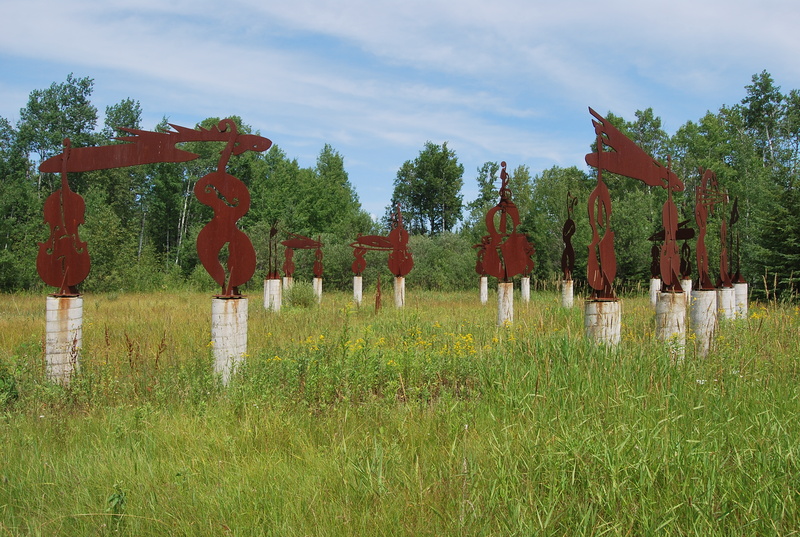 Guastafeste owned land in the area and collaborated with a group of artists, sculptors, and engineers to complete the project with his own funding and a grant from the Minnesota Arts Council. It was unvieled on July 4, 2001. Basshenge stands on the north side of the highway in a small grass field, partly obscured by trees. There are no signs. There is no parking area. There is no walking path, no informational kiosk, or anything that indicates what it actually is. It’s located just east of a blink-and-you’ll-miss-it town called Birchdale, which isn’t much more than a post office, an all-in-one general store, and a few houses. In fact, while we were looking for it, we initially drove past it and ended up turning around as we’d gone too far. Once we found it, we commented on how secluded it is and easy to miss. It took me years to finally make it to Basshenge, it’s really that far out there. But it’s a beautiful, peaceful area, and the sculpture is worth a trip. While in the area: Willie the Walleye is just down the road in Baudette, and there is a lot of outdoorsy stuff to do around Lake of the Woods and the Rainy River. Zippel Bay State Park isn’t too far either, which offers miles of sugar-sandy beach to explore. Basshenge is almost on top of the entrance to Franz Jevne State Park, which is also a cool stop on the scenic byway. Hike along the Long Sault Rapids on Rainy River. There’s also Smokey Bear in International Falls and Big Vic the Voyageur at Ranier as fun photo opportunities. The Waters of the Dancing Sky Scenic Byway begins at Sha Sha Point on Rainy Lake and stretches west through the Rainy River Valley and then on to North Dakota. This was such an amazing eye catch! Myself and a wind sister were out for an amazing ride on a beautiful day. This was my first time on this stretch of hwy. Glad it caught my eye! Serendipitous find for me today – quite remarkable. Was cruising West on 11 when it caught my eye – a couple of u-turns later I was parked on shoulder and walking through grass (not much sign of trampling by other visitors) to immerse myself. Can now claim Stonehenge, Carhenge (northwest Nebraska) and Basshenge trifecta!